"The UN sustainable development goals for 2030 strongly recognize the immediate need for the protection and restoration of our global ecosystems." The UN sustainable development goals for 2030 strongly recognize the immediate need for protection and restoration of global ecosystems. Indonesia’s rainforest is one of the most biologically diverse forests in the world, containing ten percent of known plant species, twelve percent of all known mammal species and seventeen percent of all known bird species. Yet it also has one of the highest deforestation rates in the world, and just under half of the country’s original forest cover now remains. Since the 1960s it has been consistently destroyed to make room for commodities such as pulp, paper, plywood and palm oil. (Read more here). If we keep going there won’t be any of it left. We need to change the way we consume. Most of the world runs on a “take, make and dispose” industrial model, where 85% of everything we consume ends up in a landfill. It’s not enough just to recycle what we can, we have to reimagine our entire economy. 1. Recycle | Sourcing Root Wood Salvaged from Harvested Plantations. Wood is only a renewable and eco-friendly material if it is consciously sourced. Tropical hardwoods in particular grow very slowly and in low densities, and regenerate poorly after logging. These species are often taken from forests in non-sustainable numbers, and illegal ways. Searching for a way of sourcing wood sustainably, SAYA Designs came across Made & Wayan, sculptors who dig up and recycle root wood from old commercial plantations all across Indonesia. The roots are left behind by loggers harvesting trees on large-scale production sites. They take hundreds of years to decompose and have little value for the soil. By using this waste material we are having as little impact on the environment as possible. 2. Repurpose | Contemporary Design meets Traditional Craft. Hair sticks are the original hair tool and have been used for thousands of years. They are durable, created to last and an alternative to plastic and elastic. Each SAYA hairpin is inspired by the rich flora and fauna in Indonesia, and designed to directly reflect local plant life. They are carved by hand by Balinese artisans, sanded down to the finest grain using simple tools and techniques, and finished with natural wax and oils. Woodcarving is one of the main traditional crafts that is under threat from the modern life. By encouraging traditional crafts we feel passionate that we are supporting Indonesian culture and artisanal trade. I visit twice annually on my visits to Bali and speak on the phone regularly to all those I work with. We are a very small team and I have had the pleasure to get to know them and their families well. We pay our artisans over the recommended living wage in Bali and give them the flexibility to work around religious holidays and Balinese ceremonies. 1 Hairstick | 1 Tree | 50 Lbs CO2 Savings Per Year | Enough Oxygen Generated for 2 Humans Per Year. 3. Replenish | Planting Endangered and Endemic Tree Species into Protected Forests in Indonesia. 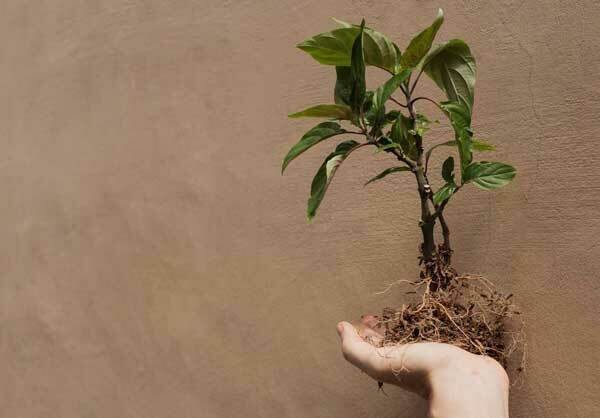 Planting trees is one of the best ways to fight climate change-related problems like soil erosion, environmental degradation, increasing average temperatures, low rainfall and increasing CO2 emissions. Our partner organisation, GAIA, is based in Jakarta with project offices in Puncak (for Ciliwung watershed rehabilitation) and Lombok (for Rinjani watershed rehabilitation). They have been developing community-based rehabilitation activities to benefit not only the environment but also contributing to the locals poor-economy through agroforestry. Gaia has been supplying high-quality seeds for fruit trees, and been nursing endemic trees to rehabilitate the watershed. They also work closely with large organizations such as the FFI, and speak on a government level to mainstream social forestry as part of poverty alleviation in forest-edge communities. The trees we support from sales are endemic trees which will be planted on degraded forest of Rinjani National Park watershed. Our commitment to you is that for every hair stick you purchase, we will buy and plant up to ten seeds through GAIA on your behalf. At SAYA we are dedicated to creating excitement and awareness around the issues we believe in. We want to invite others to deepen their understanding of environmental and wildlife conservation issues, and get involved in their protection. We want to add beauty to people’s lives by creating things with a real story to tell. We want to make change. Inspired by nature, handmade by Balinese artisans and fuelled by a commitment to the environment, SAYA Designs is a brand new, heart-centred venture. Using root wood salvaged from old plantations in Indonesia, we create unique, beautiful and functional hair sticks. 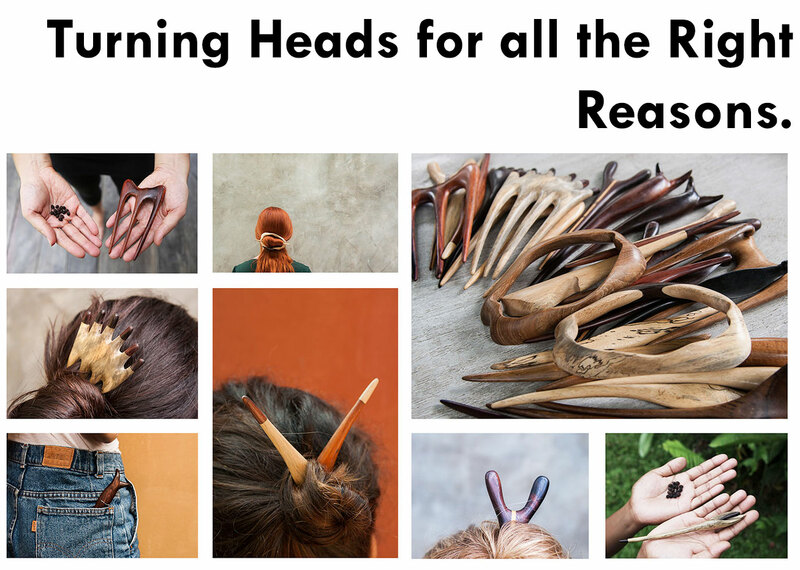 Each hairpin also gives back to the environment it came from, as up to ten endangered tree species are planted in its place in rainforests across Indonesia. This is just the beginning.